"FaithMarks" model Mariko Tinaya displays her tree tattoo. When and Where: 6-8 p.m. Friday, Lindsay Street Hall, 901 Lindsay St.; 4-7 p.m. Wednesday, noon-7 p.m. Thursday, March 28, noon-9 p.m. Friday, March 29, 9 a.m.-noon Saturday, March 30, and 8 a.m.-4 p.m. Sunday, March 31, St. Marks Church, 701 Mississippi Ave.
"FaithMarks" model Trevor Ledford displays his dragon tattoo. Varinia Maldonado-Fuller carries a tangible reminder of her faith high on her left thigh. "It's a personal reminder to me," the Red Bank resident and practicing Catholic says of the cross tattoo she had inked almost two years ago. "Everybody has their cross to bear [in] their walk with Christ. It's his will, not mine, that matters. It's his path, not mine, that I walk." 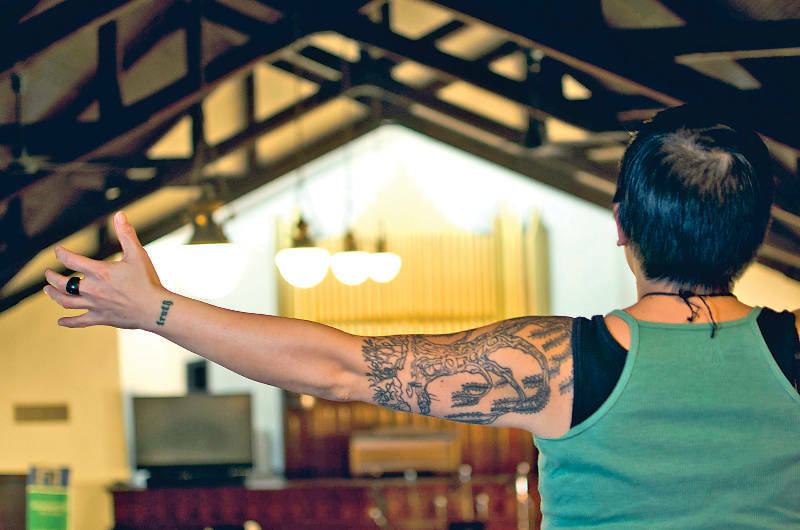 Maldonado-Fuller is one of the subjects in "FaithMarks," an exhibit of photographs of spiritual tattoos that debuts Friday at Lindsay Street Hall. The exhibit then will be on display next week, during Holy Week, at St. Marks Church in North Chattanooga. "We wanted to find a way to meet the people of North Shore where they are," says project co-coordinator Anna Golladay, a member of St. Marks. "We're in the heart of the most eclectic part of the city, and we feel like this bridge between the arts and spirituality is really a nice ... tie-in." The exhibit includes 22 photographs -- all on canvases 4 feet high or wide and all taken at the 100-year-old St. Marks Church -- and attendant stories about the tattoos that explain the individual's personal faith journey or spirituality. The models were not all Christians, according to Golladay, but also were Jewish, Buddhist and even agnostic. "Whether it's a nature-based spirituality or a spirituality not driven by their trust in a God," she says, "their tattoos are also spiritual. We wanted very much for there to be a very distinct blend of spiritual tattoos, not just faith-based tattoos." Golladay says she expected most of the tattoos would be crosses, doves and Bible verses but was delighted at the variety that emerged. "A lot of the imagery [transferred] the idea of what the person believes," she says. "One woman has a hummingbird tattooed at her hip. People may say that's not a spiritual tattoo, but to this young women, a hummingbird is the only bird God created that has the ability to fly backwards. She perceives that represents her ability to look backwards to what she's come from to see what she's flying toward." Similarly, Maldonado-Fuller says her tattoo is about more than a piece of jewelry that would be worn or the act of going to church regularly. "It's a part of who I am," she says. Maldonado-Fuller added a second spiritual tattoo, a dove just behind her ear, earlier this year. The dove often represents the Holy Spirit in the Christian faith. "As I'm growing into my faith," she says, "I need to hear more [of God saying], 'Be still and know that I am God.' I need to quit talking [and hear God saying], 'Listen to what I have to say.'" Tiffany Jaworski of Sweet T Studios, who served as photographer for the project, says each model was different but each had a tattoo that told a story. "[The tattoos] were all tied into everything that they are as a person now, their lifestyle, the choices they make," she says. "They were different but the same." Jaworski, who has two spiritual tattoos herself -- a Scripture paraphrase on her back and a bird with a phrase that means "God the healer" on her side -- says she didn't know who was coming for the photo session and what tattoo they had. When they arrived and told their stories, she was able to figure out a relevant spot in the century-old church for the proper photograph. Even her husband, Patrick, got into the show with his Celtic cross tattoo. "Hopefully, we got everything to fit," she says. "I think it worked out." The initial display Friday and the subsequent exhibit at the church were funded by an evangelism grant from the Holston Conference of the United Methodist Church and by funds in the local church's budget. Although the intent of evangelism in the Christian faith is to draw people closer to Christ, Golladay said, the project is more aimed at starting a conversation. "There's a cynicism associated with corporate worship right now," she says. "For us, we would always welcome people to come to St. Marks because they liked the concept of FaithMarks. But we wanted to show that arts have as much of a place under our roof as people [invited] to Sunday worship. "Some people have visited St. Marks because of this, but we didn't go into it to increase our membership or get people to come to church Sunday morning."